Hello everyone, this was a requested recipe by a good friend of mine, Jason. Here's my version of potato salad. Okay, here's the long part of the potato salad. Peel the whole head of garlic. You'll need a pot with a lid (preferably Le Crueset). Do this next step with the lid off: Add a splash of olive oil and pan sear sliced pancetta until brown then remove pancetta till later. In the same pot, add the butter and garlic to the pot and melt butter. Add potatoes to the pot and put the lid on, reduce temp to low and let them steam in butter and garlic, stirring occasionally, until barely able to poke with a fork (al dente) Roughly 25-30 min. 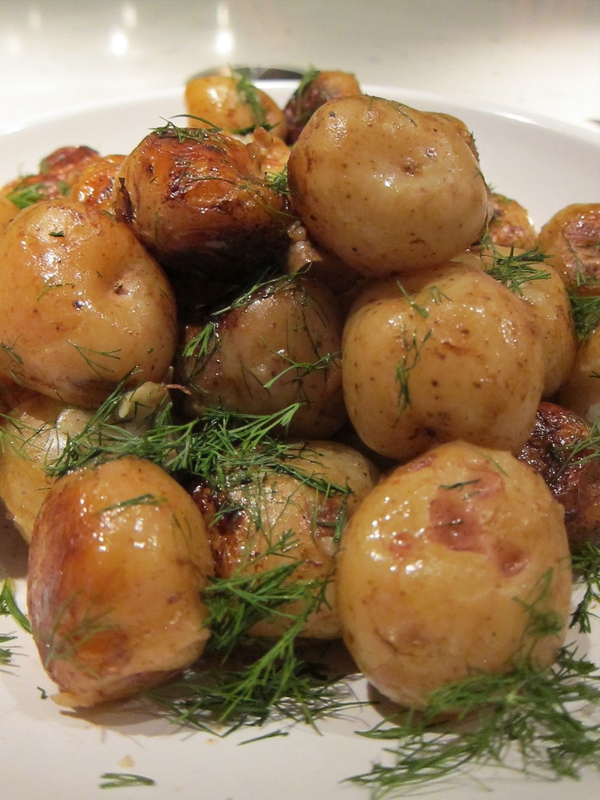 Once done, remove the potatoes and caramelized garlic (set garlic aside). Right away, cut the potatoes in half or quarters to stop the cooking process and cool them on a tray outside or in the fridge. Add olive oil, dijon, chopped herbs, balsamic, caramelized garlic, red wine vinegar salt and pepper, dried tomatoes and stir. Once potatoes are cooled, add dressing, stir and let soak, then serve. Top with crispy pancetta. Sorry, no picture of last summers salad. Picture below is after potatoes have poached.